When I heard of the website lovethesales.com I thought I'd just take a look to see what was available, and I was surprised to see how many brands are always on sale in just one place. At this point of the year, I'm already thinking of autumn, like I told you in my last post, and I wanted to see if I could grab myself a few bargain pieces that not only would get me through the end of summer, the transition period to autumn but also right through fall, and that is exactly what I did. With countless trendy pieces, I grabbed myself a few things I will be wearing non-stop, as these trends are set to carry on through the next season and here they are! Floral prints are a summer given, not exactly groundbreaking but we all love the power flower. 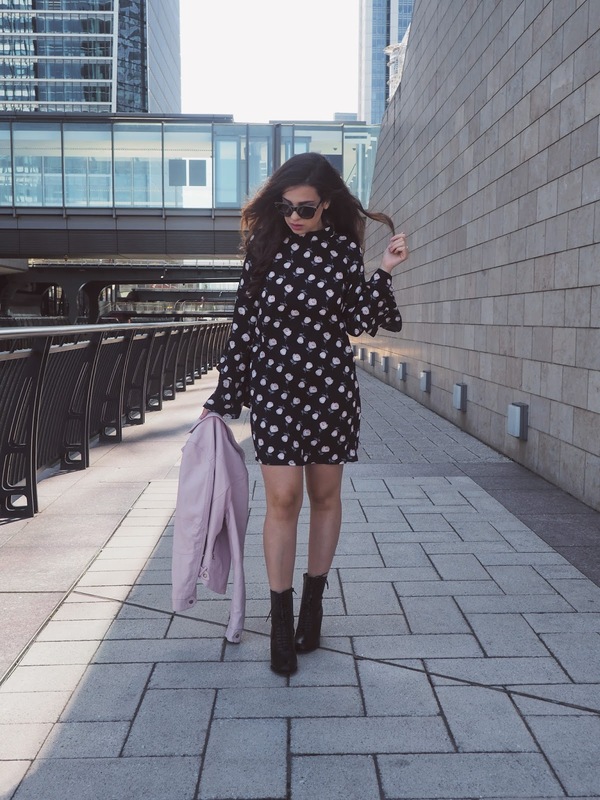 And, I've talked about wearing florals in the fall, and one the tips I give in that post is to go for a darker print. Deeper shades make a seasonal difference in your closet; plum, burgundy, ebony and dim grey, for example, are key fall shades that work extremely well with floral prints. Additionally, we are not yet done with the bell sleeve craze and I am so glad as I love dramatic sleeves, they add that little oomph to the outfit. Imagine this dress without these sleeves...it wouldn't have the same effect! For the end of summer wear this dress with flats and sandals, and for fall pair with some tights for warmth, ankle boots and a leather jacket, because #layering! Aka combat boots, but heeled ones. Combat boots are going to be huge next season so imagine my surprise when I found this gorgeous pair on sale! I'm a boots hoarder, and my collection grows every year and this is one pair I couldn't resist adding to the rest of them. It is extremely comfy thanks to its block heels and I cannot wait for the chillier weather to bring these out more often! At less than £20, it won't be breaking the bank either, an absolute bargain if you ask me. For now, pair it with a skirt or a dress for a night out but come fall, these will look good with pretty much anything! I'm thinking serious rocker/biker vibes, maybe an all black outfit with a bit of faux fur and a nice crossbody bag. For accessories, I chose this Na-kd pair of sunglasses, also from the sales. I had heard of the brand before but never tried anything, and I'm glad it didn't disappoint. These sunglasses are a little different than anything I own, somewhat classier and when I think of winter, faux fur and an elegant outfit, these will come in handy. They are very good quality despite the small price tag and I can't wait to explore more of Na-Kd as I've seen so many of you wearing their stuff! Tell me, are you planning for autumn already like I am? Ever thought of searching for autumnal clothing in the sale? Let me know what you think about my picks below! happiness and good vibes only! I refuse to think about autumn right now, I still have my summer holiday coming up. When that one is over, that is when I embrace transitional pieces. Beautiful dress, you look stylish as always! love the statement sleeved dress! Gorgeous! Wonderful dress! And the boots are perfect! Look lindo amei as imagens, obrigado pela visita. I need to add that dress into my wardrobe! It's beautiful and very flattering and the leather jacket is gorgeous too! Dressing a season ahead in the sales is always such a great idea! This dress was made for you! The print is so pretty and I adore the sleeves. Looks so wonderful styled with the boots too. Sales are so good... and you look lovely with this great dress, Pam! I loved the boots as well and the price won't break the bank, you are right! I really love this outfit, it's lovely! Hope you have a nice day! Love this dress! It's so good to already start thinking about your fall wardrobe.. Such a gorgeous outfit! I love how you pair that cute dress with leather jacket, it's so chic. And gorgeous hair by the way. Loving you're style, this outfit is on point! Flawless look, Pam! The pink leather jacket is a great touch! and the series perfect, reminds me of a Fashion Editorial. And I love the Dress, the print suits you perfectly.